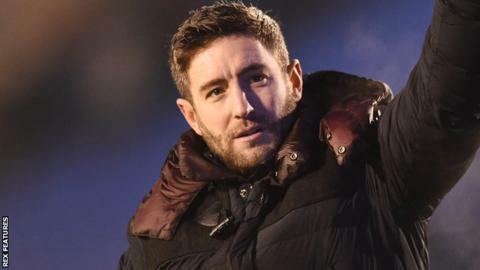 Bristol City have appointed Barnsley head coach Lee Johnson as their new boss on a three-and-a-half-year deal. The relegation-threatened Championship side had been without a manager since sacking Steve Cotterill on 14 January. Johnson, 34, played for the Robins from 2006 to 2012, scoring 11 goals in 199 games for the club. He left Oldham in February 2015 to replace Danny Wilson at Barnsley, who reached the Football League Trophy final on Thursday. Johnson, who was given permission to speak to the Robins on Friday, will watch Saturday's game against Charlton from the directors' box. The former Yeovil and Kilmarnock midfielder is the son of Cheltenham Town boss Gary Johnson, who was in charge at Ashton Gate from 2005 to 2010. His former assistant Tommy Wright and coach Paul Heckingbottom have been put in temporary charge of the Barnsley first team, with the Yorkshire club saying that "proper compensation" has been agreed for Johnson. Bristol City chief operating officer Mark Ashton told the club website: "Lee is a very bright, intelligent young man who is highly motivated and very detailed in his approach. He's well-known to the club; fans, stakeholders and staff. "He is one of the up and coming coaches in the country and having interviewed him, I had no hesitation in recommending to the board that Lee is the right fit for this football club." Barnsley were 22nd in the table in November after losing eight straight games, but have since climbed to 12th, and reached Wembley by beating Fleetwood on Thursday. He was named League One Manager of the Month for January after guiding his side to victories in all five league games. City are currently 22nd in the Championship, having won just one of their four five matches under interim manager John Pemberton, who will remain at the club as first team coach.